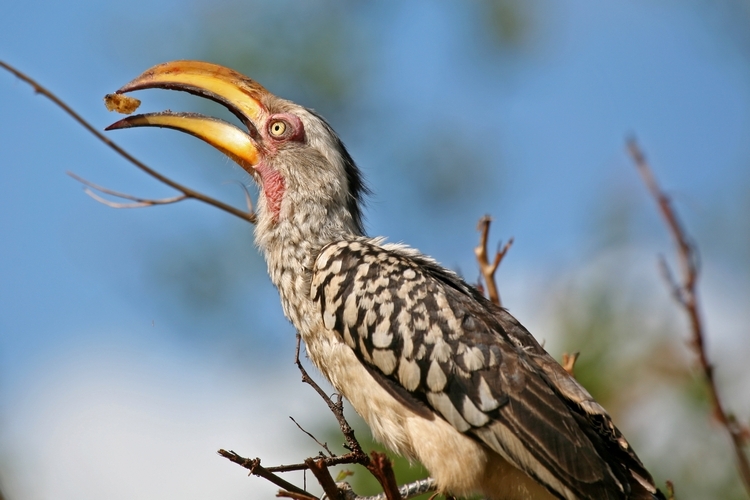 African Birds 1 - Pale Billed Hornbill, South Africa: The Pale Billed Hornbill (Tockus pallidrostris) is a species of hornbill in the Bucerotidae family. It is wildy distributed and can be found in Angola, Democratic Republic of the Congo, Kenya, Malawi, Mozambique, Tanzania and Zambia. 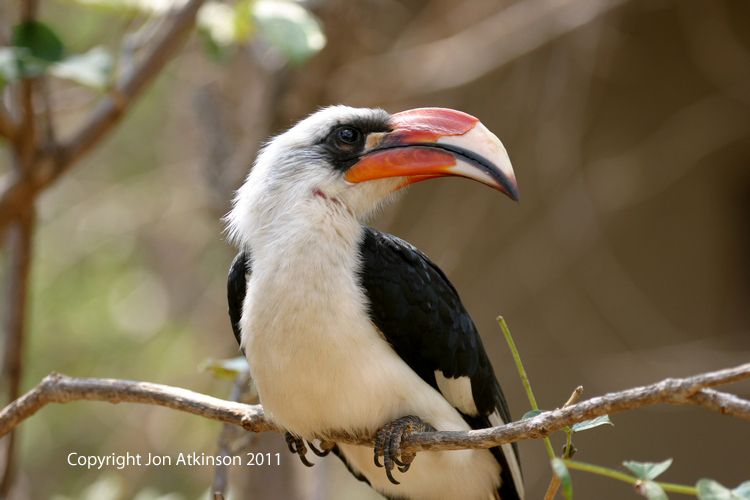 African Birds 2 - Von Der Decken's Hornbill, Tanzania: In the Wild: Von der Decken’s hornbill is found across eastern Africa from central and eastern Tanzania, throughout Kenya, and into southeastern Ethiopia and Somalia. The Von der Decken's Hornbill is omnivorous, eating insects, fruit and seeds. 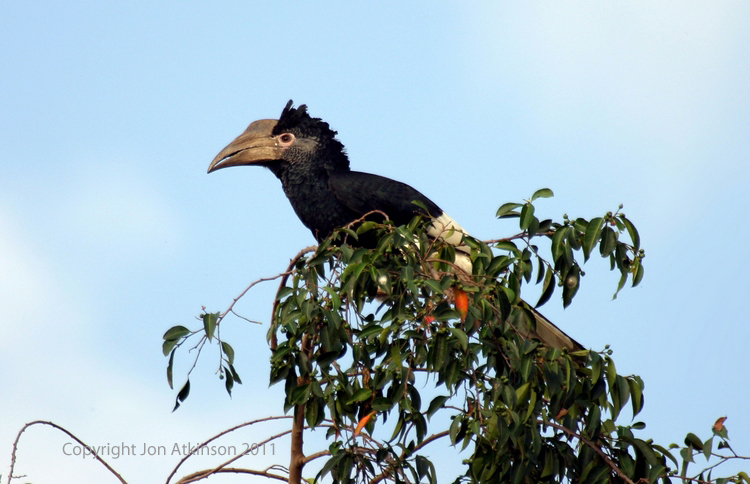 This species is a small hornbill which has mainly whitish underparts and head and blackish upperparts. It has a long tail and a long curved bill which lacks a casque. African Birds 3 - Black-and-white-casqued Hornbill, Uganda: Black and white casqued hornbills are most commonly found in subtropical and tropical lowland and mountain forests, they are also found in plantations or urban areas up to 2.600 m above sea level. These birds are mostly frugivorous, with the fruits of "Ficus" trees composing more than half of their diet. 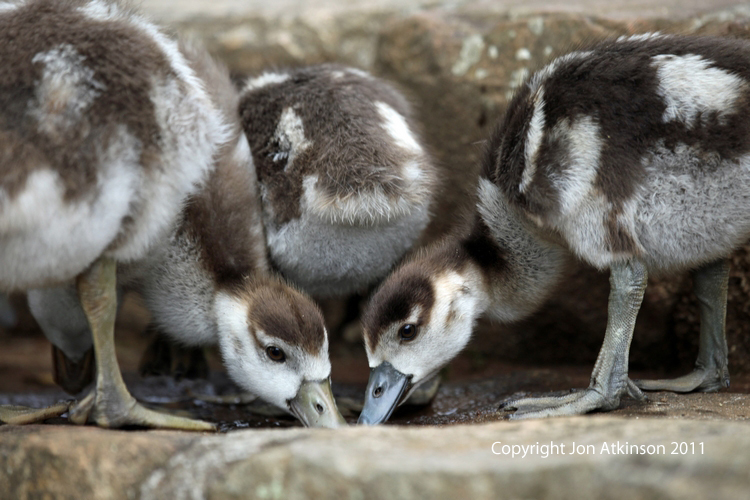 African Birds 4 - Egyptian Geese Chicks, South Africa: Egyptian Geese are found south of the Sahara to and including South Africa as well as the Nile Valley. They frequent rivers, marshes, and lakes resorting to a wide range of nesting sites. Cavities and holes in trees and abandoned nests of other birds may be selected; also ledges on cliffs and banks. African Birds 5 - Ostrich, South Africa: The flightless ostrich is the world's largest bird.n adult male will stand nearly 8 feet in height and weigh between 140 to 230 pounds (63-105kg). 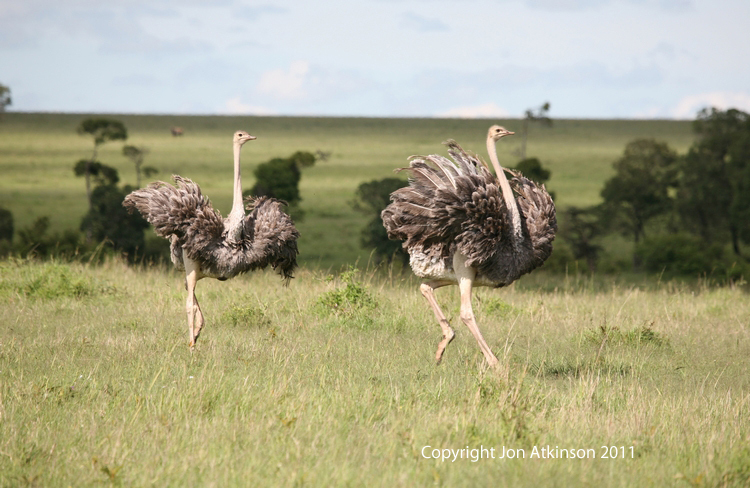 They roam African savanna and desert lands and get most of their water from the plants they eat.Though they cannot fly, ostriches are fleet, strong runners. They can sprint up to 43 miles an hour and run over distance at 31 miles an hour. African Birds 6 - Grey Crowned Crane, Tanzania: The range of the Grey Crowned Crane in eastern and southern Africa stretches from eastern Democratic Republic of Congo, Uganda, and Kenya to southeastern South Africa. 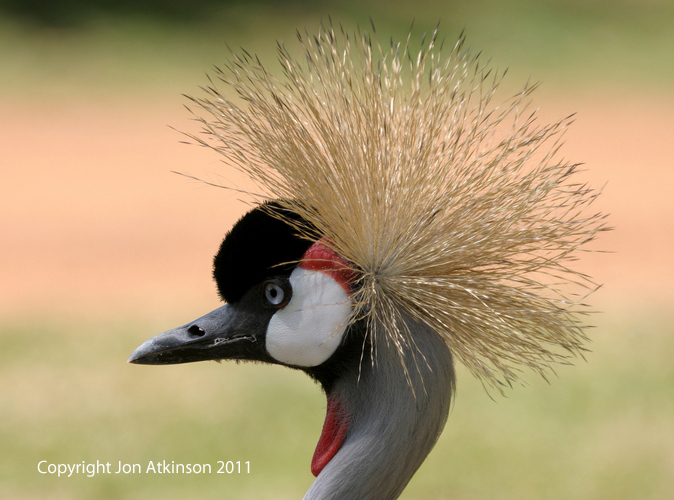 Grey Crowned Cranes require mixed wetland-grassland habitats. They typically nest within or on the edges of wetlands, while foraging in wetlands, nearby grasslands, and croplands. 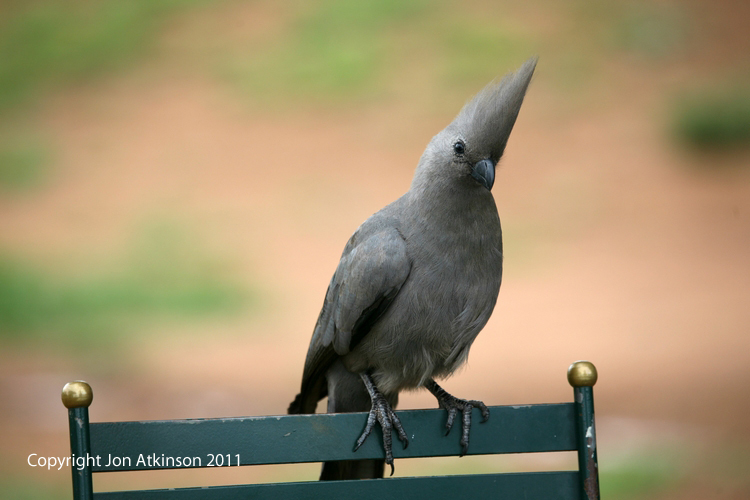 African Birds 7 - Grey Go-Away-Bird, South Africa: A very common bird of the bushveld, it is often referred to as the "Go Away" bird because of its characteristic call. They are dependant on water and need to drink daily. Thier diet constists of fruits which make up a large portion of their diet. They have a characteristic alarm call to ward off birds of prey which other bird species react to. 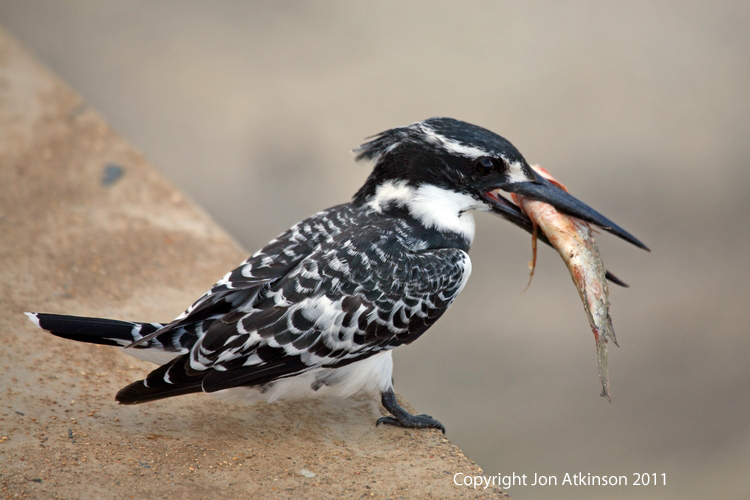 African Birds 8 - Pied Kingfisher, Tanzania: The pied kingfisher is quite common and has a large range across Africa and Asia. Both sexes excavate their nest into a vertical sandbank. They are monogamous cooperative breeders; which means that the breeding pair may be assisted by nest helpers, who are either offspring from previous breeding seasons, or unrelated birds whose own nesting attempt failed. African Birds 9 - Grey Crowned Crane, Uganda, Africa: The Grey Crowned Crane has a breeding display involving dancing, bowing, and jumping. It has a booming call which involves inflation of the red gular sack. It also makes a honking sound quite different from the trumpeting of other crane species. The nest is a platform of grass and other plants in tall wetland vegetation. 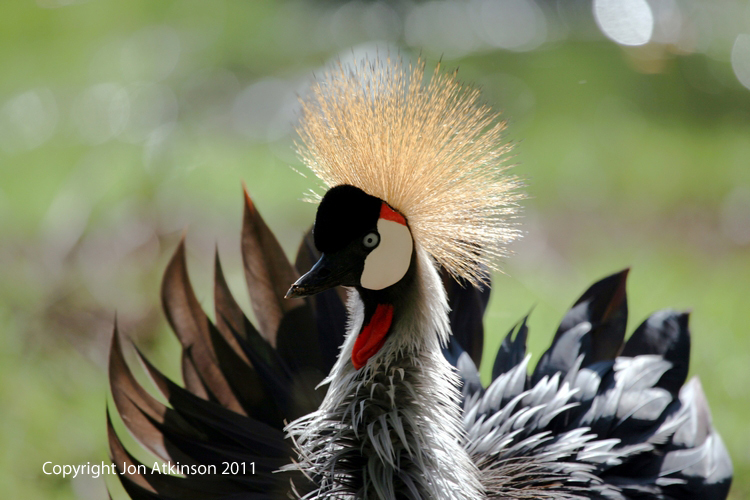 The Grey Crowned Crane lays a clutch of 2-5eggs. Incubation is performed by both sexes and lasts 28–31 days. Chicks fledge at 56–100 days. African Birds 10 - Blue Crane, South Africa: The elegant blue crane is the national bird of South Africa. As the common name suggests, it is pale blue in colour, although it can appear grey from a distance. It is a relatively small crane with a large head, thick neck and beautiful elongated wing feathers, known as tertials, that trail behind this bird and are often mistaken for tail feathers. 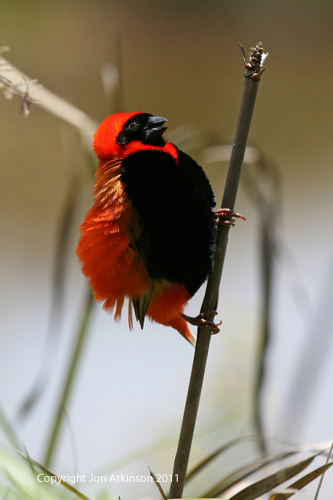 African Birds 11 - Southerm Red Bishop, South Africa: This beautiful inhabitant of the South African marshy grassland and cultivated areas in open country is a common species. Often seen perched on reeds the Southern Red Bishop utters buzzy, chirping sounds as advertising calls. The contact call is a nasal “chip” or “wheet”. Alarm call is a harsh “chak”. 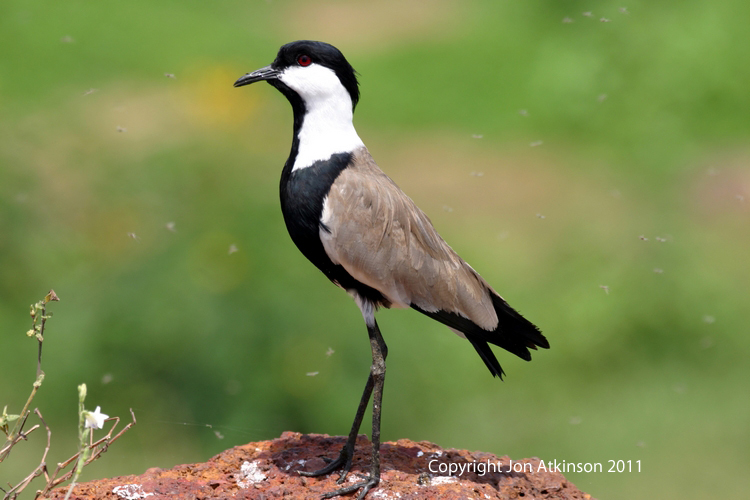 African Birds 12 - Spur-Winged Plover with Lake Flies! Lake Victoria: The Spur-Winged Plover has a preference for marshes and similar freshwater wetland habitats. It breeds around the eastern Mediterranean, and in a wide band from sub-Saharan west Africa to Arabia. The Greek and Turkish breeders are migratory, but other populations are resident. The bird got its name because of a spur (a small claw) hidden in each of its wings. 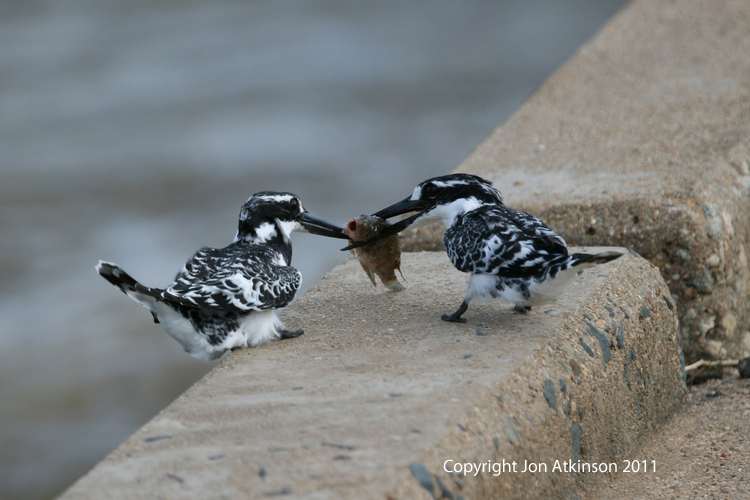 African Birds 13 - Pied Kingfisher, Tanzania: he Pied Kingfisher feeds mainly on fish, supplemented with invertebrates. It often uses the hovering technique for catching fish, searching for prey from a high vantage point in the air, then diving straight down into the water to grab the prey item. It immediately flies back to its perch, where it beats the prey to death then swallows it. African Birds 15 - Cape Sugarbird, South Africa: The Cape Sugarbird is common in theWestern Cape including in botanical gardens and mountain slopes. 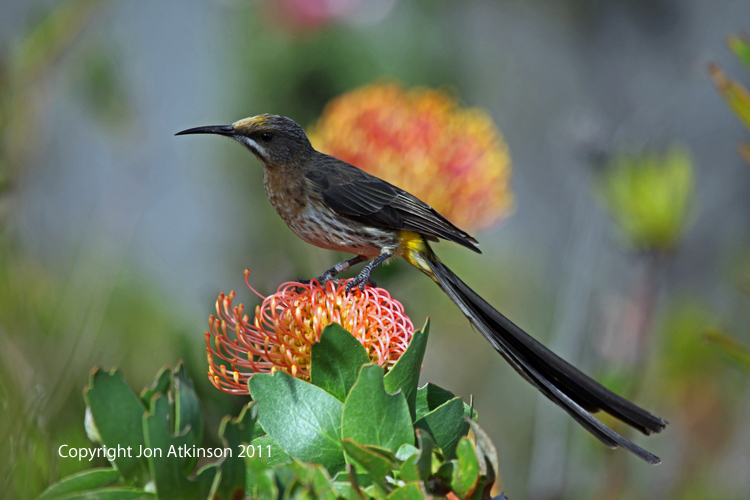 The Cape Sugarbird is one of a family (of only two species, Gurney's Sugarbird being the other) which is restricted to Southern Africa. It shows a preference for Fynbos, which has many protea plants. 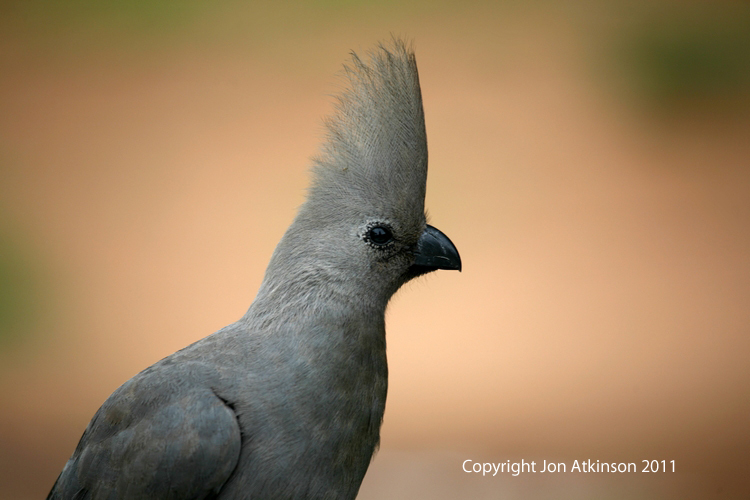 African Birds 16 - Grey Go-Away-Bird, South Africa: Grey-go-away-birdsor grey-louries inhabit dry savannah especially with Acacia trees and in dry riverine woodland. Also found in numbers in suburban gardens. They are locally nomadic in response to fruit availability. They are usually found in groups of 3 to 20. A feature of this bird is to climb and jump around in trees whilst showing off the crest by raising and lowering it. 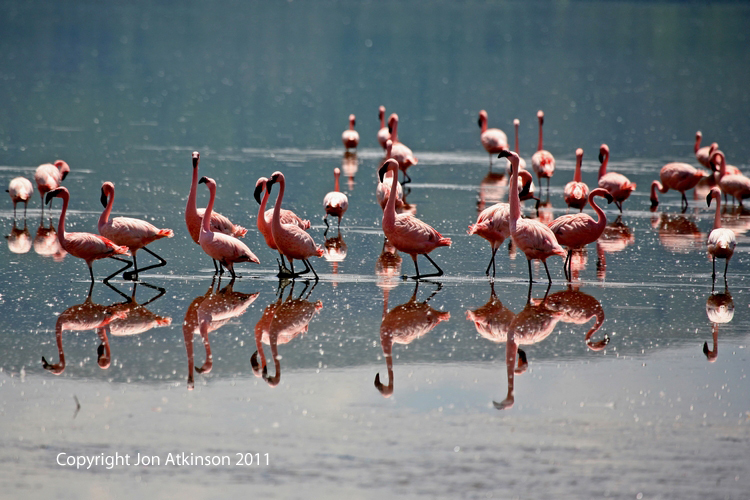 African Birds 17 - Lesser Flamingo, Kenya: The Lesser Flamingo is the smallest but most numerous species of flamingo. They grow up to 1 meter in height, they have a wingspan of approximately 1 meter and they weigh up to 2 kilograms. They are light to dark pink in colour but immature birds are grey before they gain their full adult plumage. 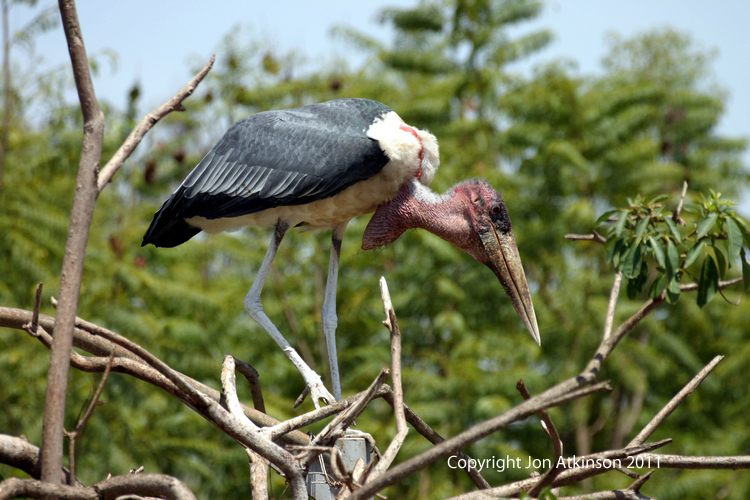 They have a long neck and long pink legs with relatively small webbed feet. 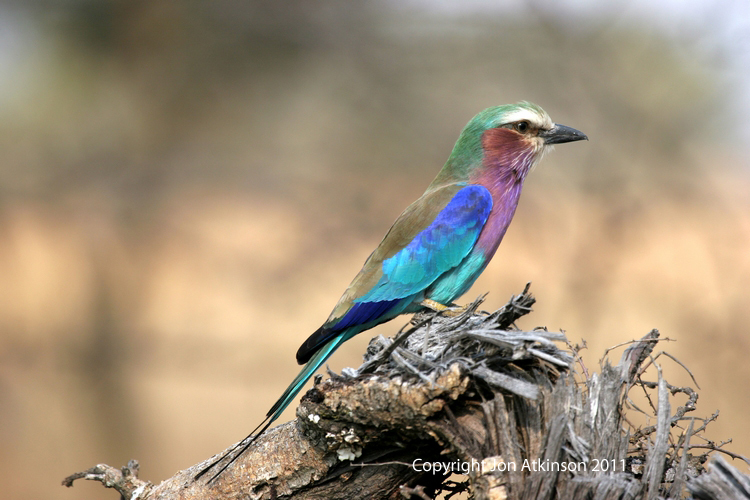 African Birds 18 - Lilac-Breasted Roller, Tanzania: The Lilac-breasted roller is found from Eritrea and Somalia south to the northern half of southern Africa, where it is common in dry woodland. 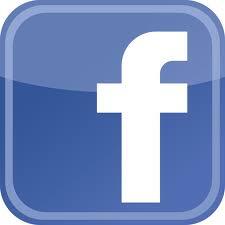 It feeds on a wide variety of animals, preferring insects over reptiles, arachnids, birds and rodents. 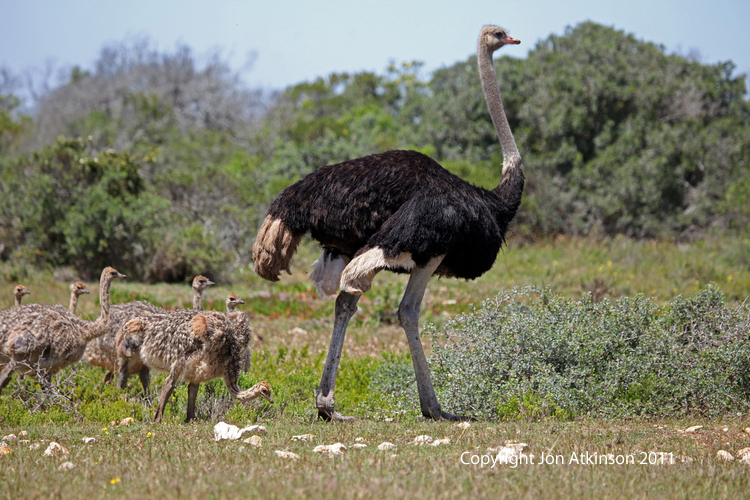 African Birds 19 - Ostrich, South Africa: Ostriches are nomadic, wandering wherever food is most readily available. However, they never stray very far from water, of which they need a gallon-and-a-half a day. Excellent eyesight and acute hearing are the ostrich's most important senses. Like a giraffe the ostrich is an important sentinel for many African grazing mammals such as antelopes, zebras, giraffes and gazelles. 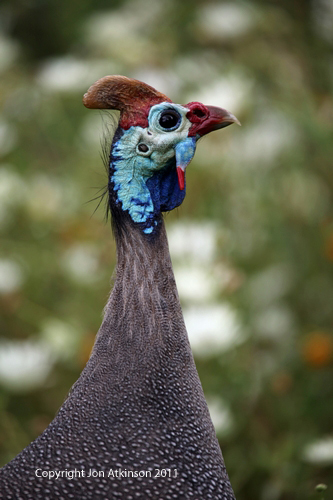 African Birds 21 - Yellow-necked Spurfowl, Kenya: The Yellow-necked Spurfowl is found in North EastAfrica in Ethiopia, Somalia, Tanzania, Kenya and Uganda. It is widespread and common in bushed grasslands, scrubland around watercourses and also cultivation. This is a common, distinctive, noisy bird which is most active at dawn and dusk. They are generally found in pairs or small groups often on dirt roads. 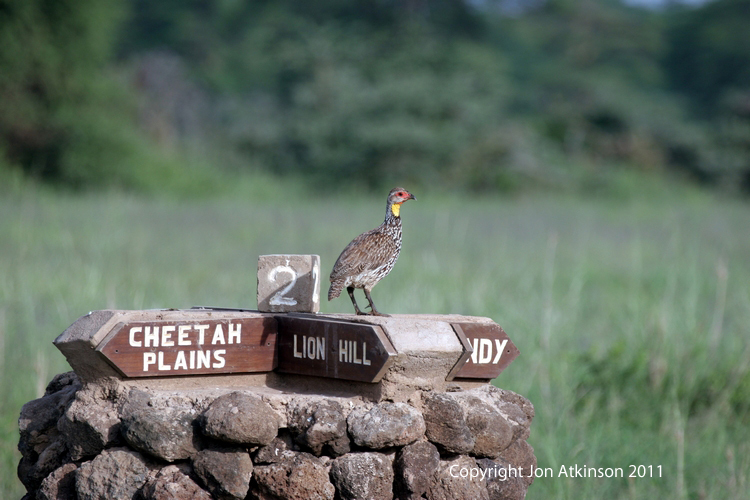 The males are often seen (and heard) calling from the top of termite mounds or large rocks. 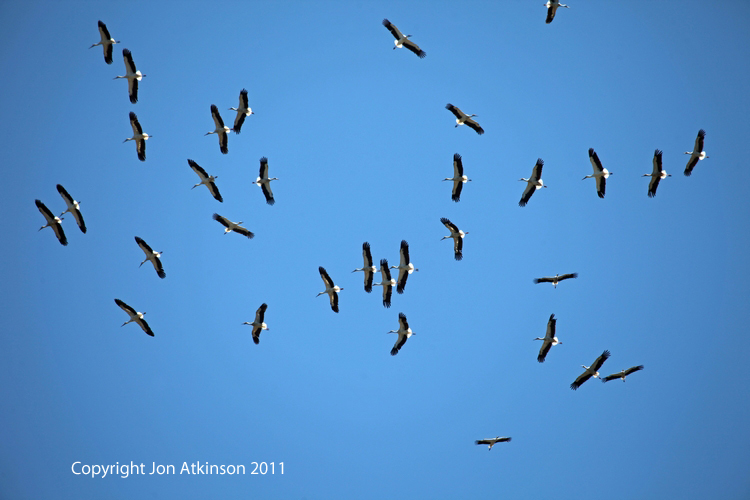 African Birds 22 - White Storks, South Africa: White Storks belong to the Order Ciconiiformes, Family Ciconiidae, and Genus Ciconia.They mainly frequent open areas and wetlands. This species is more terrestrial in Africa where the most part of the population winters. At this period, it is found in steppes and savannahs, grasslands, cultivated areas with pools, marshes and slow streams, lakesides, all with scattered trees for nesting. Their usual prey include fish, amphibians, reptiles, small mammals, large insects, and whatever kind of available food. 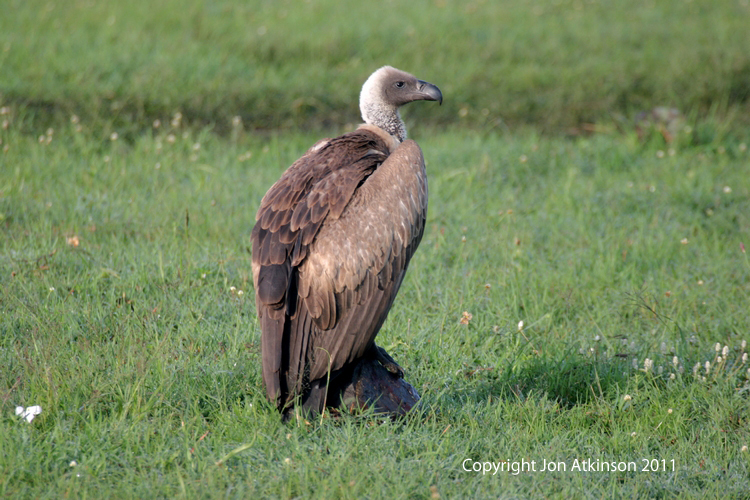 African Birds 24 - Ruppell's Vulture, Kenya: Ruppell's Vulture is a large vulture that occurs throughout the Sahel region of central Africa. 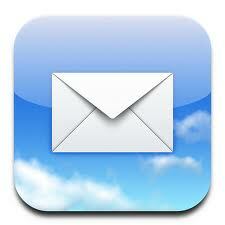 The current population of 30,000 is in decline due to ongoing loss of habitat and other pressures. Rüppell's Vulture is considered to be the world's highest-flying bird, with confirmed evidence of a flight at an altitude of 11,000 metres. They have an especially powerful bill and, after the most attractive soft parts of a carcass have been consumed, they will continue with the hide, and even the bones, gorging themselves until they can barely fly. All photography is copyright © Jon Atkinson and images may not be reposted without express permission.